Made this wedding quite the splash! We had a blast at the Excellence with our family and friends & on our honeymoon. Everyone was delightful, the service was excellent, and the Dominican is gorgeous. We even had the chance to walk the beach from the Zoetry to Dreams and see some other resorts. We think we chose the right one! 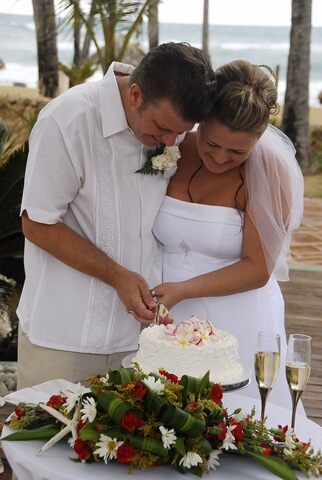 We knew we wanted a tropical wedding and we wanted our special day to be as stress-free as possible. 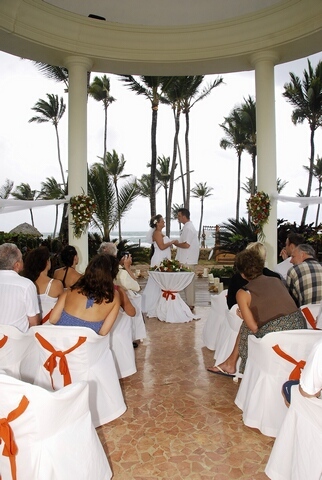 What made you decide on the resort/venue? It was really just a process of elimination. We wanted to experience a new place together, and we’re both pretty well traveled, so we ended up choosing the Dominican Republic. 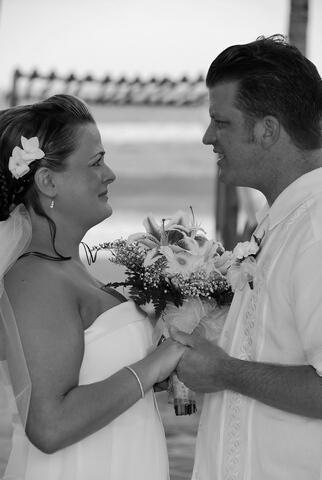 We provided the travel agent, Terrah, with a few things we thought were important to us as a couple, and the resort we ultimately chose was one of a few Terrrah suggested based on the criterion we provided her with. Terrah was a huge asset! Absolutely no regrets! Great choice! Who was your photographer, and if you had one, your videographer? Both photos and video were provided in-house by Photo Souvenir. The entire staff was great! The entire wedding day. As the bride, EVERYTHING was taken care of for me – from breakfast in bed, champagne, hair, makeup, getting dressed – you name it, it was taken care of – and with great class! From the groom’s perspective, he was also a bit pampered. The resort offered a complimentary groom’s suite the night before the wedding. He had a wake up call, all his clothes were pressed, and he was updated every minute until the horse drawn carriage delivered me to the isle. Just how extremely stress-free the entire event was – trust me, this is a HUGE statement coming from someone who stresses over just about anything. EVERYTHING went off without a hitch – even including the brief rain showers both right before and right after the ceremony. 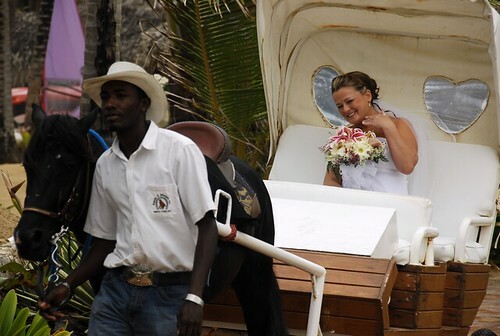 The biggest surprise to me, the bride, was that it truly was the happiest day of my entire life – no worries whatsoever! I just smiled!